Posted by Barbara Prime at 3:52 p.m.
November 25, 2009 at 4:09 p.m. I love it! Would you consider making it a PDF file to download? Thanks for the happy smile on my face! November 25, 2009 at 4:17 p.m.
November 25, 2009 at 4:33 p.m. The mice are soooo cute! Thank you so much for sharing the pattern. November 25, 2009 at 4:46 p.m.
thank you for sharing this pattern, I look forward to knitting the mice. November 25, 2009 at 5:10 p.m.
November 25, 2009 at 5:26 p.m. Absolutely darling, thanks for sharing this wee pattern with all of us! Your patterns are awesome! And so well written, a joy to knit! November 25, 2009 at 6:12 p.m.
Gosh, Barbara, I wasn't expecting it to be a free pattern! Thanks so much for doing that. The mice are totally adorable. However, in honor of the very long tail I saw this morning when I opened my dishtowel drawer, I think I'll make mine a RAT! Happy Holidays! November 25, 2009 at 7:18 p.m.
November 25, 2009 at 7:54 p.m. 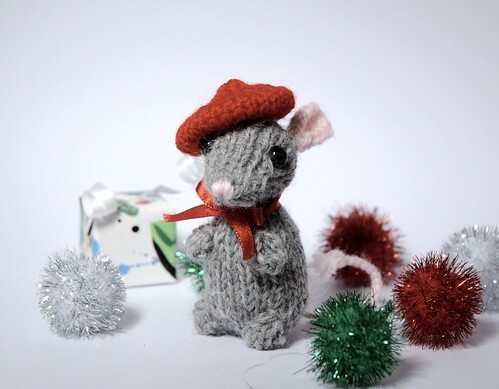 Thank you so much for this charming mouse pattern--you are so generous! This a great present for all of us. :) I can't wait to cast on! November 25, 2009 at 8:19 p.m. Thanks eversomuch for the adorable pattern. The mice are wonderful!!! THanks for sharing your pattern! November 25, 2009 at 10:53 p.m. Thank you so much for this lovely pattern. The mice are adorable. November 26, 2009 at 4:23 a.m.
November 26, 2009 at 6:29 a.m.
Aww they are so cute! Thank you so much for the mice pattern! November 26, 2009 at 11:32 a.m.
November 26, 2009 at 12:52 p.m.
DEar Barbara, thank you for this lovely pattern! These mousies are so cute!! November 26, 2009 at 1:13 p.m. These are adorable! Thanks for sharing:) Happy Holidays. November 27, 2009 at 3:27 p.m.
November 27, 2009 at 7:51 p.m. Thank you for sharing such a cute pattern - and shame on you for adding to my holiday knitting list (I'm kidding!!!) 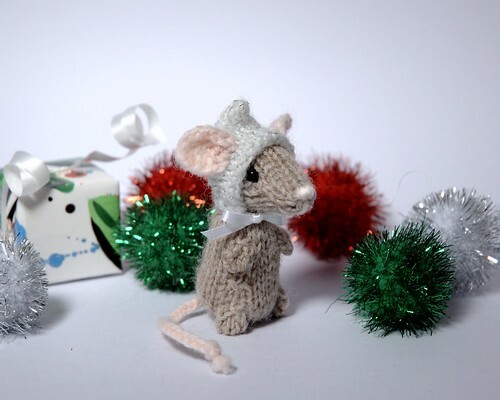 - My mom likes mouse-stuff and these are adorable!!! November 30, 2009 at 8:32 p.m. Thank you for doing this! 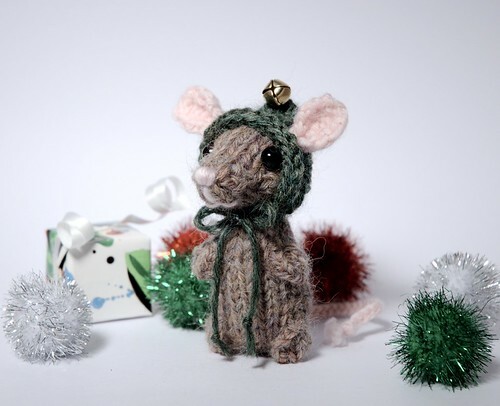 The mice are adorable and I can't wait to try making one, more if I can. December 1, 2009 at 10:18 a.m. I am so wanting to make one right now!! Thank you for your generosity. December 4, 2009 at 5:52 p.m. These are just adorable! Thanks so much for the pattern! These are already on the list for Christmas next year. December 24, 2009 at 6:33 p.m.
January 23, 2010 at 9:20 a.m.
January 30, 2010 at 11:43 a.m.
August 23, 2010 at 11:34 a.m. These little guys are so cute! I write for a site called Today's Mama (www.todaysmama.com) and I'm currently writing a series on Christmas Crafting. I would like to link to this post and wanted to ask your permission to use the first photo. I will give photo credits to you. Let me know. October 24, 2010 at 4:26 p.m.
November 2, 2010 at 5:21 a.m. Thank you SO much for this incredibly adorable pattern!! You are so talented (and generous)! November 13, 2010 at 10:02 p.m. The mice are the sweetest things! Thank you so much for sharing your wonderful talent!! November 14, 2010 at 10:06 a.m. Thank you so much for the pattern. They are the cutest things! December 3, 2010 at 8:52 p.m.
December 11, 2010 at 4:07 p.m.
December 14, 2010 at 5:19 p.m.
How did I miss these when first posted? 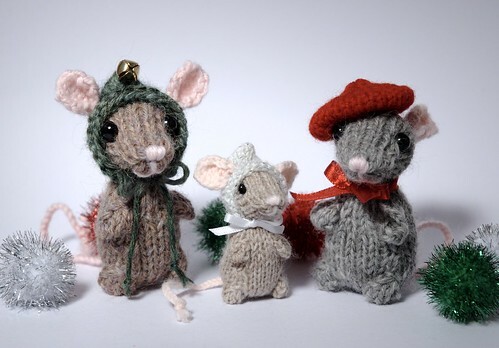 Now I know how I'll spend my New Year -- knitting next year's Christmas Mouse ornaments! Thank you for sharing this adorable pattern. December 23, 2010 at 8:04 p.m.
December 25, 2010 at 9:26 a.m.
January 2, 2011 at 1:43 a.m. I haven't seen any patterns this adorable in quite some time! I shall definately make a set of these adorable "Little Cuties". I know I shall cherish them! January 11, 2011 at 2:10 p.m.
November 10, 2011 at 10:31 a.m.
Terminé el patrón con tus indicaciones, y la cabeza me quedó extremadamente grande. Además no explicas si es el patrón del ratón pequeñito o de los papás??? September 22, 2012 at 6:52 p.m.
December 17, 2012 at 3:44 a.m. Going to try as decoration for a baby gift. Thanks for your generosity. December 20, 2012 at 1:26 p.m. Going to try to accompany a baby gift. Thanks for your generosity. December 20, 2012 at 1:27 p.m. So very sweet! Thank you for sharing with us. Happy Holidays! November 15, 2013 at 12:38 p.m. I love these! I first found the pattern a few years ago and have made about a dozen since. I wanted to make a couple more this year (friends wanted me to add to their mouse family)and couldn't find my print out. Horrors! I'm so happy I found this blog again! Thanks so much for this pattern! December 20, 2013 at 1:54 a.m.
February 7, 2016 at 7:10 p.m.